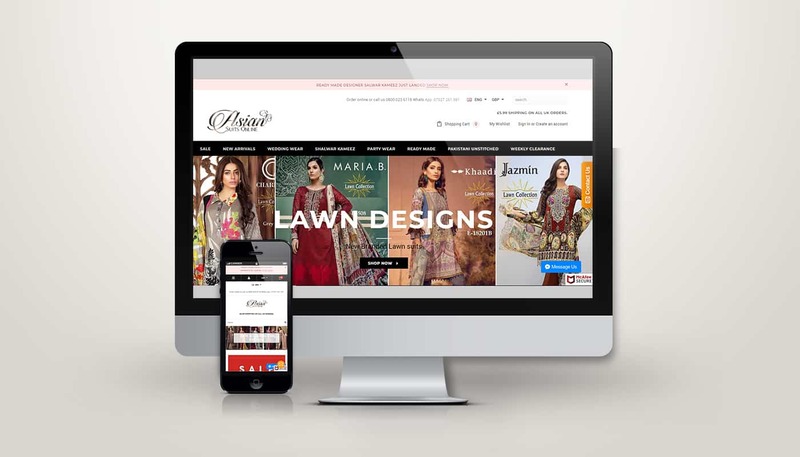 Asian suits online is an e-commerce clothing store where they provide Indian/Pakistani style clothing for women. They have been established for over a year and have grown rapidly with the help of Blue Factory Media. They provide a large variety of Asian women’s clothing to customers all over the world and have a massive fan base because of their affordable prices and stylish clothing. As Asian suits online main goal from the day they started was to provide their products online only and to a global scale, they knew straight away that they wanted an e-commerce website. Asian Suits Online wanted to create a brand like other clothing retailer such as ASOS. Which means we had to start from scratch. Our goal was to design a logo that would last and won’t need changing over time as the company grows every year. Along with the logo, Asian suits online wanted a website that was easy to use for their customers and could provide an easy check out system. As this was a new website, Asian suits online website needed work on their Search engine optimisation (SEO) to help increase organic sales. Finally the last goal for Asian suits online was to increase their fan base on Instagram. Once we sat down and discussed everything with this client, we knew exactly what they wanted and started to build their business right away. We worked with Asian suits online to understand their brand values – safety, value for money, quality, industry leading – and offering articulating into a number of logo options. The chosen brand was selected on its appeal to the target audience group and memorability, ready for use on the website and marketing material. The colour palette and typography used signify the elegance of the brand. The new website features the best in usability and functionality, placing form and function at the forefront of delivery. Asian suits online deliver their products across the globe, as such it was vital that we included enhanced features such as extra security and a more direct way of communicating with their customers such as Facebook Messenger. This allows the user to have their questions answered quicker which meant happier customers. The website is fully responsive to mobiles and tablets to ensure the website is futureproof and accessible to all devices. So customers can order their products no matter what device they are on. Blue Factory Media has achieved continual organic traffic growth for Asian suits online over a year. We fully optimised the Asian suits online ecommerce website ensuring it would rank for key industry related terms. During the project we always maintained a traffic based approach, targeting a wide range of keywords through thorough technical optimisation, outreach and content creation – for example infographics. We continue to work on an all-round service including on-page optimisation, content marketing, and outreach. Through extensive research, specific posting times and carefully selected hashtags, we were able to increase the Instagram followers for Asian suits online. In the space of a year we were able to grow their Instagram account to over 20,000 followers and still growing. © 2018 Blue Factory Media, All Rights Reserved.